Boyer on the Legacy of Rev. Dr. Martin Luther King, Jr.
Today is Martin Luther King, Jr. Day, a federal holiday honoring the birth of an American civil rights leader, activist, and religious leader. Across the country, people will be reflecting on the life and legacy of Dr. King and participating in acts of service as a way of remembering his important role in our national history and in the quest for civil rights for African Americans. We all rejoice, of course, that a national holiday has been dedicated to the memory of this extraordinary individual. if we fail to bring the message of Dr. King into the nation’s classrooms, memories will fade, our celebration will become increasingly superficial, and the holiday will be a time when we remember only the symbols, not the substance, of his work. First, all students should study the life of Martin Luther King to understand, more precisely, the social and intellectual heritage of our nation. . . .
[Second,] I’m convinced that all students should learn about Martin Luther King not only to gain historical perspective, but also to understand the power and poetry of the written and spoken word. . . .
[Third,] all students also should study the life of Martin Luther King to understand more fully the relationship between what they learn and how they live. 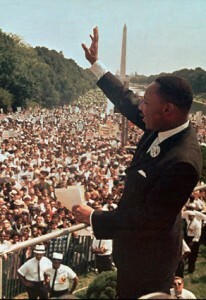 Martin Luther King, Jr. acknowledging the crowd gathered in Washington, D.C.
Today we Americans observe a federal holiday in remembrance of one of the greatest forces for peace and justice that ever lived. Yes, for a lot of people the best thing about today is having a day off work or school. I won’t deny that is a nice perk. I mean, who doesn’t love a three-day weekend? No one. However, amongst the extra errands you may be running to get a head start on the work week, or the extra relaxing you may be enjoying to recuperate from the hectic weekend, we should all carve out a few minutes of our day to remember the life of Martin Luther King, Jr. To remember how he lived so fearlessly for a cause of equality which he pursued tirelessly. To remember the words he spoke so eloquently. To remember that the echoes of his words still ring today, and that some are hearing his words for the first time. 1.) A study of Dr. King’s life, work, and legacy introduce students to the 20th century freedom movement in the United States. 3.) Students that understand Dr. King learn that what you learn in life influences how you live. Education has the power to teach morality. Education has the power to inspire service. Education has the power to fuel mission. The life of Martin Luther King, Jr., better than most, highlights these human imperatives. 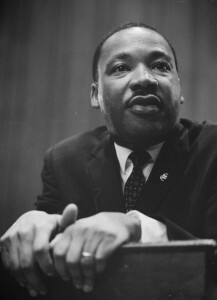 Photo courtesy of The Seattle Times gallery on Martin Luther King Jr. and the civil rights movement.